Raniben D Nagesh, aged 39, lives in Arambada village in Gujarat with her mother-in-law, husband and two children. At the tender age of 17 Raniben was married off and sent to rural setting, a foreign environment compared to the hustle bustle of a modern city where she came from. Not used to rural life, her life took a 360 degree turn. Initially leaving her scared, apprehensive and unsure with no family being close by, but soon she started adjusting to her new life. Raniben had been educated till class 7 before her marriage. With the support of her in-laws and husband she completed her 12th as well after marriage. Being from Mumbai she knew how exposure will help her so in her village, Raniben became a member of a Self Help Group (SHG). She turned out to be an excellent artisan and through her skill got a job with Okhai where she keeps growing and becoming more senior. As she has received so much from working at Okhai, she wants to pay back by teaching other women skills that she has amassed over the years. She is doing so much for her community: created more SHGs, helped many villagers in financial distress, built a temple and a water tank. Her love for education has led her to create an education fund that was donated to a local school for the children of migrant workers. Raniben is in full control of her earnings. Through her job she has been able to build her own house and educate her children in good schools. She would like her daughter, aged 17, to become a teacher. Her aspirations for her 14 years old son are for him to be successful in whatever he chooses to do. Thanks to Raniben, her children have got educated and can look at a brighter future. This absolutely marries Women on Wings’ belief that a woman vis-à-vis a man will spend her earnings on her children hence creating a better future. Raniben’s life has transformed because of a job and income. Her own personality has taken a U-turn; she is a happier, confident and contributory person. She finds happiness in learning new skills, language and interactions with new people. Today, she dreams of a happy and peaceful life for her family. Raniben has become a shining example of how a job can change lives to other women and particularly to the next generation. Her family is extremely proud of her achievements and cannot stop singing her praises. 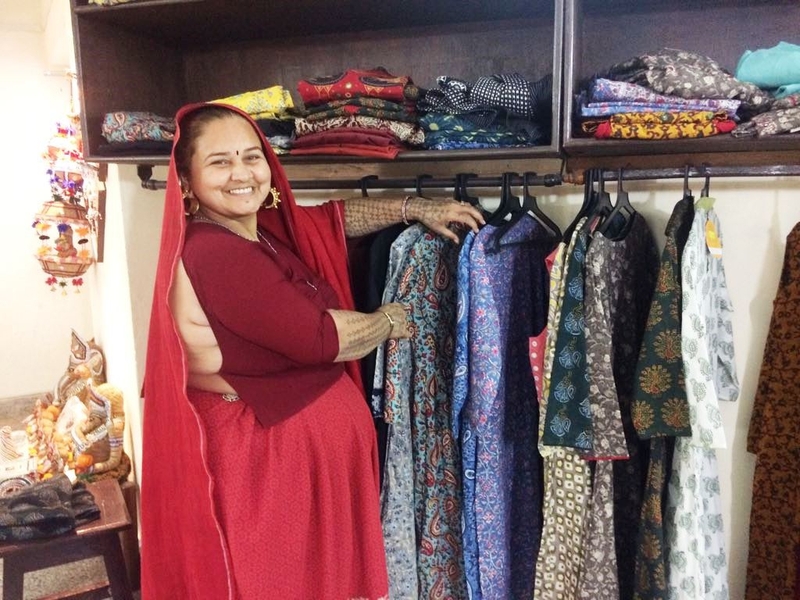 Okhai offers handcrafted apparel and lifestyle products created by rural artisans from across India. These artisans are gifted with traditional skills to craft exquisite designs, unique to their culture and heritage. Women on Wings and Okhai partner since November 2016 to realize their joint mission to create more jobs for rural women. Since then, over 300 extra jobs have been co-created.